In the two months to end the 2018 cycle and then here in the full 2019 cycle Dan Mullen and Company have pulled some cats out of hats – especially from out-of-state. Prime examples are going into the Peach State and pulling highly coveted prospects such as Emory Jones, Tyron Hopper and Jaelin Humphries, stealing Mohamoud Diabate out of Auburn or going out west and reeling in Chris Steele. However, the new staff's recruiting acumen might be best displayed by the shocker Florida pulled out on National Signing Day by staying in-state and flipping Fort Lauderdale (Fla.) Cardinal Gibbons Consensus Top 100 defensive end Khris Bogle‍ from Alabama and right from under the nose of Miami. The 6-foot-4, 215-pounder – who is the Consensus No. 79 rated prospect in the nation – visited Florida back in the spring, but still had programs such as Miami and Tennessee ahead of the Gators. As late as the Adidas All-American Media Day in early January, he told Inside the Gators that he was unsure whether or not Florida would receive an official visit, before committing to Alabama later that week during the game broadcast. Two key events happened that week. 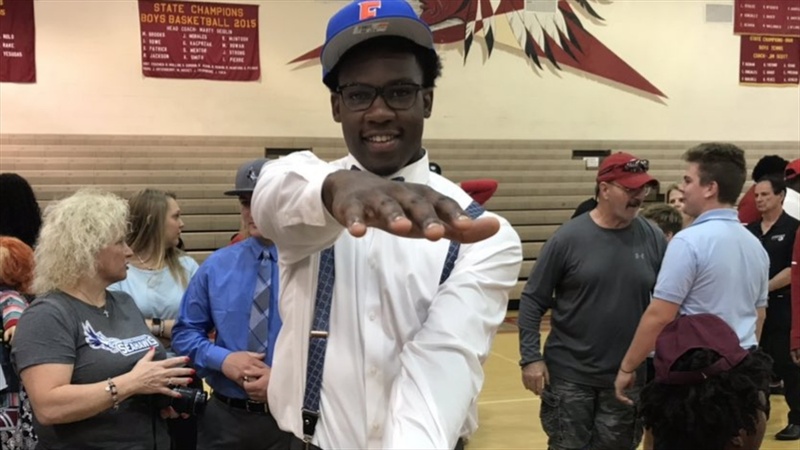 Current Florida commit Diwun Black was in his ear, and the two solidified plans to officially visit Gainesville during the same weekend. That visit helped turn the tide, but according to Bogle, he didn't decide back then. He was going back and forth right up until the very end. "I really made my final decision this morning,” explained Bogle. “But like, I had in mind that I thought I was going to Florida. And then when I prayed and asked God, God just led me to Florida. "When I got up here, I just knew I was going to Florida." After finally making up his mind Bogle gave Florida a call - speaking with Mullen and Todd Grantham. "Happy. And I told coach Grantham. Unbelievable." According to Bogle, there were two main selling points to going to Florida. "It's not too far from home, but it's not close to home,” he said. So that's a great thing. And my sister's at FAMU, so it's like two hours away from there." Florida envisions lining Bogle up as a stand-up edge rusher. "I'm just going to give my all to Florida now. I'm 100 percent in. Coach Grantham, he's a great coach."